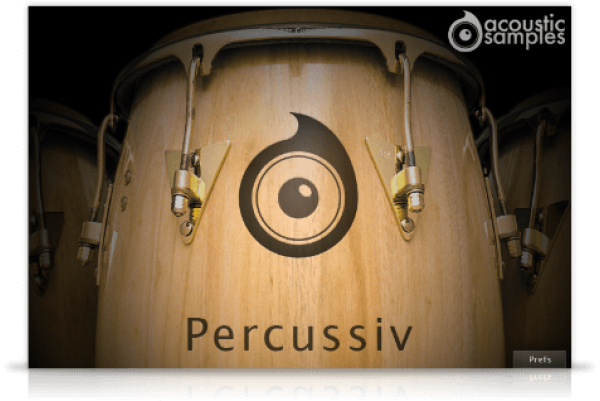 As opposed to traditional percussions libraries, Percussiv' is based on the detail of each instrument so that each one of them is playable and sounds realistic. The Mixer: You can change the volume, pan and pitch of each element, you simply need to play it first to select an element and then you can modify it, make sure the Midi Group Select is on (you can also choose the Element in the menu). You can load / unload the samples of each element to save ram and speed up the preset loading. 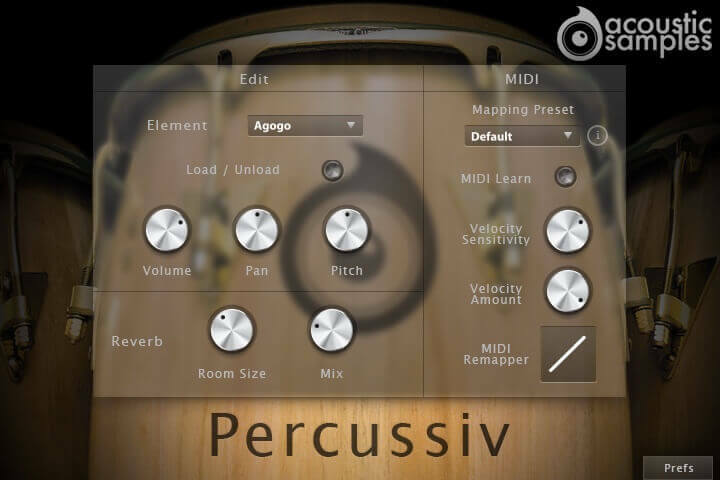 There is a completely unloaded preset available if you want to start from scratch. As you press a key, the Element you just played will be chosen and you will see the paraleters change as well. The shakers have a special function that allows the samples to be retriggered at the note off, this allows you to play very fast shakers lines very easily. 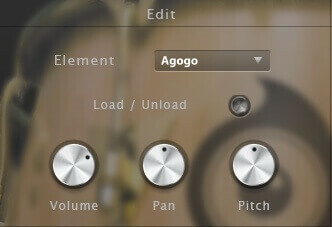 The Mapping Presets: we made some presets of the most popular drums formats (GM, or default) or you can create yours. To know the composition of the default preset, just click on the "i" and the mapping will appear note by note. 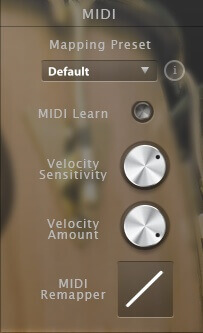 The Velocity Amount will set the minimum volume for velocity 1 and give you access to all the dynamics that you want. The Velocity Sensitivity controls the volume cure. The Velocity Remapper remaps the velocity output. 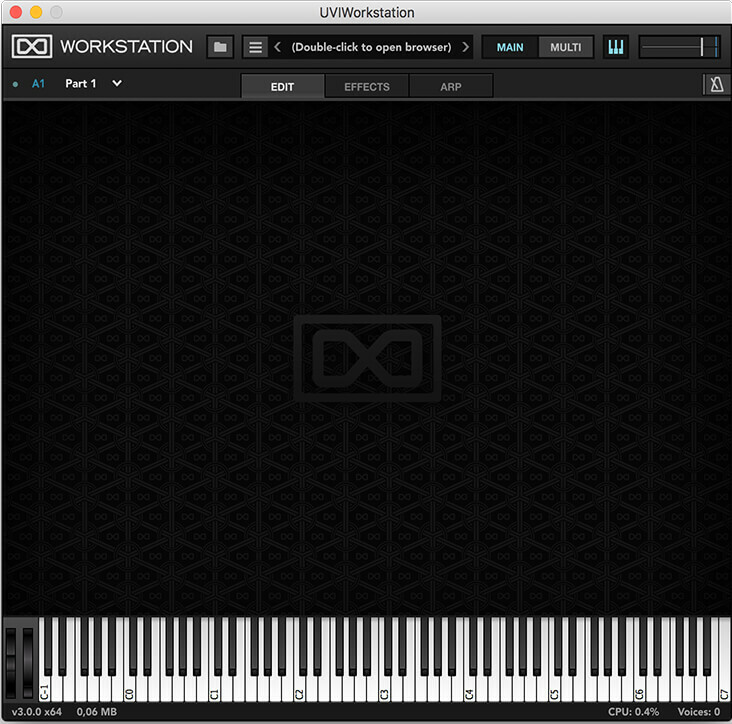 Percussiv comes with its own sample player, the UVI Workstation 3 (requires v3.0.0 or later). 1.16Gb uncompressed, 565Mb compressed in lossless flac format, around 4367 samples. 4 to 8 Round Robins. Up to 15 velocity layers (sometimes 15x8 = 120 samples per element) depending on the instruments. Mapping preset default, GM and custom. 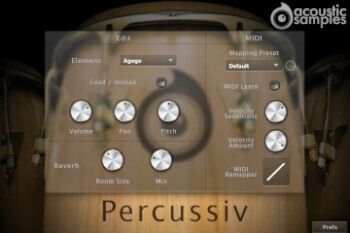 Advances functionnalities to be able to change the volume, pitch and pan of each instrument. Instrument list: Agogo, cowbell, berimbao, bongos, 2 claves, congas, chinese gong (tamtam), guiro, 3 shakers, cabasa, tambourine, brazilian tamborim, triangle, udu drums, 5 woodblocks.